Roger Ackling Using rescued pieces of driftwood collected during ocean-side walks, British artist Ackling crafts intimate minimalist sculptures whose presence far exceeds their small scale. Softly weathered but sharp in form, the pyramidal, cubic and rectangular wood pieces are etched with meticulous burnt striations, created by training the sun's rays through a magnifying glass. These lines, which cover the diminutive items' full surface area, move steadily over and between the occasional bent and rusted nail. The work speaks as much in its finished form as it does of its means of arriving there: distilling a habitual communion with nature — from ritual walks to the studied harnessing of the sun — the small sculptures are products of the elements as much as they are of the artist's hand. Jewel-like, the ten pieces appear as relics to moments perhaps otherwise quantified as trivial, when nothing was uttered and no greater action occurred than the lapping of waves and the clearance of a cloud layer. Through January 22, 2011, at Schmidt Contemporary Art, 615 North Grand Boulevard; 314-575-2648 or www.schmidtcontemporaryart.com. Hours: noon-5 p.m. Wed.-Fri., 10 a.m.-4 p.m. Sat. and by appointment. Mario Trejo Presenting the trials and errors of a self-imposed quest to execute "at least one million hand-drawn and counted idiosyncratic circles" with pen on enameled panel, local artist Trejo distills this supreme act of enervation into a series of paintings recalling the placid semblance of the night sky. The rendering of the circles varies from piece to piece, per the "idiosyncratic" dictate: Some works appear like a glossy expanse of solid black, while others depict the drawn equivalent of a tangle of gray and black rubber bands. As the artist's statement admits, this is not work with Zen-like ambitions; rather, a calculator was in one hand, noting marks, while the other was at work drawing circles. What seems to be the more likely "moral" of this elected Sisyphean task has something to do with art's love of novelty and heroic expertise: How does one acquire the miracle of creative genius? Given a question that large, an attempt to approximate the cosmos seems as good a place to start as any. 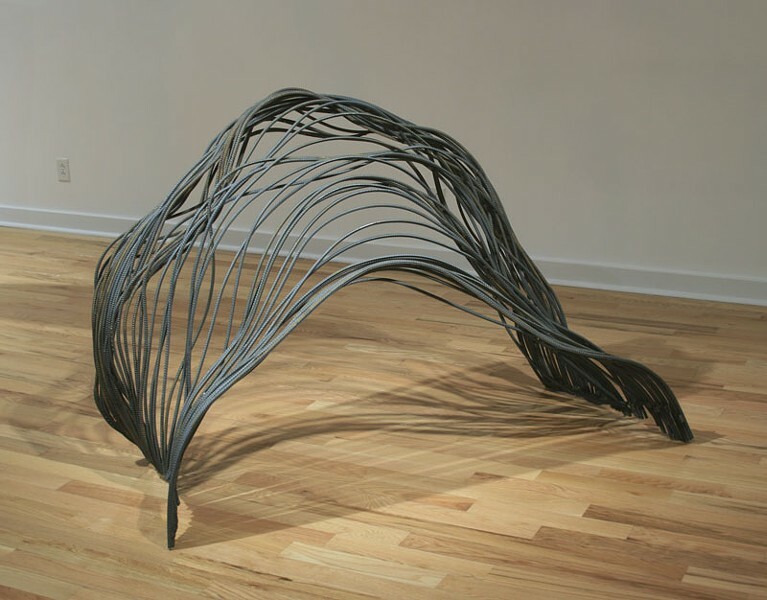 Through January 7, 2011, at Metropolitan Gallery, 2936 Locust Street; 314-535-6500 or www.thenu-artseries.org. Hours: 11 a.m.-5p.m. Wed.-Fri., Saturday by appointment. Overpaper This selection of works on paper features both local and national artists, including Carmon Colangelo, Jill Downen, Ann Hamilton, Judy Pfaff and Buzz Spector. Hamilton's Carriage is a handcrafted version of the pleated seventeenth-century collar known as a ruff; in this version the frills are the product of fanned-out paperback pages, which have been diced into thin strands and rebound at the neckline. Knowledge, it's suggested, is an awkward freight, or a conspicuously outdated adornment. Jill Downen has translated her white-on-white plaster installations into elegant two-dimensional forms, where bright white paper subtly ripples with an undulating (and fleshlike) surface texture of white gypsum. Judy Pfaff's piece is "paper art" at its most opulent extreme: In a large wall-mounted shadow-box, silk flowers, paper boats, scraps of newspaper and other seeming detritus cluster to assemble a kind of faux terrarium, where the most unnatural elements play the role of nature at its most wild. Also showing — Leslie Laskey's Portraits: Artists and Friends, which reimagines the gallery's entry space as a lamp-lit reading room, in which drawn and painted portraits of the artist's favored forebears hang in gilt frames or lean in piled decorative arrangements. The effect is unapologetically nostalgic and, as such, charming — endorsing full throttle the romantic myth of the golden age of avant-garde "genius," from Picasso to Giacometti to Stein. Through January 15, 2011, at the Bruno David Gallery, 3721 Washington Boulevard; 314-531-3030 or www.brunodavidgallery.com. Hours: 10 a.m.-5 p.m. Wed.-Sat., noon-5 p.m. on the first Sun. of every month and by appointment.